Over a decade ago – way back in 2006 – Sony came out with the first E-Reader and the world was forever changed…wasn’t it? The truth is, while the e-reader spawned iBooks, the Kindle, and the Nook, the world as we know it didn’t change as drastically as predicted. It was pronounced that print was a dying breed. In 20 years, newspapers and magazines would be extinct. Consumers would resort to the internet for their news updates and celebrity gossip. Instead of pulling out a book, people would pull out their tablets. Libraries would be virtually non-existent. But these predictions, like those for the radio when the television was released, are a bit over-dramatic. Like the radio and television, we have learned in the past 10 years that print media can peacefully co-exist with digital media, and consumers still rely on both outlets. Those who thought that physical copies of novels would cease to be were surprised to find that, though the e-reader is a great technology that helps enhance and supplement an individual’s library, it does not – and never will – replace it. Consumers, we’ve found, prefer to turn and earmark actual pages. Think about it – Every iPhone comes with a News Stand app pre-programmed in your phone. How many times have you opened it and skimmed through some of the magazines and newspapers there? Now imagine you’re in a waiting room at your dentist’s office and on the table beside you is a stack of magazines. Odds are, you’ll peruse some of them and maybe even read an article or two. With print media comes a loyal following. 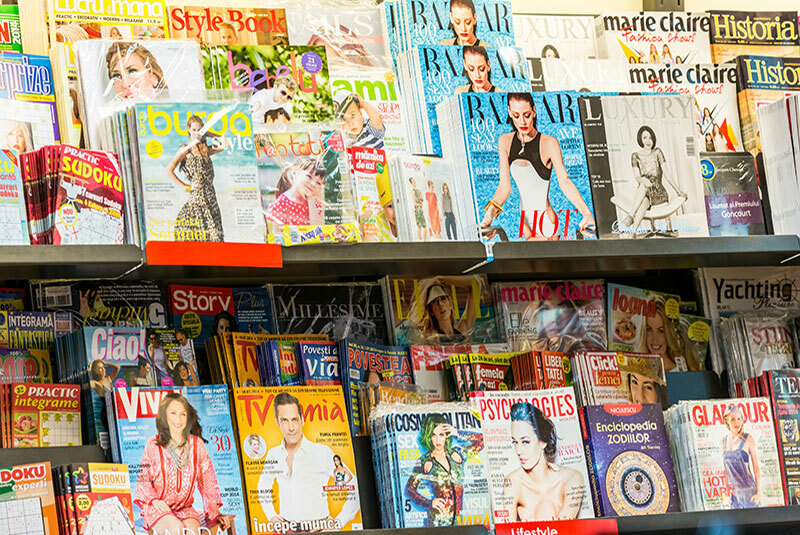 For those who advertise in a magazine, you are sure to reach a targeted audience who is genuinely interested in finding out more about that specific category or topic. If you were presented with two magazines – let’s say one focuses on golf tips, gear, and real life stories while the other features recipes, cooking tips, and kitchenware. Which would you choose? Probably the one that resonates most with you where you might find something interesting. From there, you may rip out a page with a particularly appealing recipe on it or take a picture of a set of golf clubs that you want to look into buying. Readers are also more invested in magazines because they don’t feel as if they’re being distracted. When you’re driving, how often do you really pay attention to the commercials? Same as the television, your answer is probably “not too much.” That’s because they are interrupting what you’re actually interested in. You turned on the TV to watch your favorite show and you turned on the radio to sing along to some great music while you drive. Commercials and ads are just interruptions which annoy the consumer. When someone picks up a magazine, however, it’s typically not interrupting anything. They’ll be more invested in what they’re reading and will therefore recall it later. One benefit of advertising in print magazines is, not only have you reached and possibly sold that particular reader, but you can assume that you’ve sold some of their friends, too. How so? With print media exposure comes what is called “pass-along exposure.” Let’s use Today’s Bride as an example. I’m a bride going dress shopping with my bridesmaids. I show a few pictures of gowns I loved from the magazine to my consultant. One mother-of waiting outside of a fitting room asks if she can borrow the magazine while I try on dresses. She finds a dress for her bride within the pages, and decides to get a copy of the magazine for herself so they can look through it for other ideas. A few months later, one of my bridesmaids is engaged, herself! I pass along the magazine to her to help her plan her own wedding. One benefit of print material is that it can be passed around endlessly, and your ad is always there for every bride (or consumer) to see. Because these girls are a target audience, truly interested in what they’re reading, they’re more likely to subscribe to the magazine themselves, so they can receive all the most recent information and become loyal followers. So one of the brides this copy was passed to really loved the ad she saw for a gorgeous reception hall. From there, she goes online to view their site. Not only is print working for you in physical media world, but it’s increasing your exposure and online searches in the digital world, too! Bonus – she trusts that this is a credible site, because she found it first in Today’s Bride magazine. We all know that anyone anywhere can put anything on the internet; that’s why wikipedia isn’t to be trusted, right? I could create a website advertising that I can sing opera for your procession down the aisle (and trust me, no one wants to hear that), but that doesn’t mean a bride should hire me. She can’t trust everything she reads on the internet, but if I were to pay for an ad in a magazine, it proves to her that I am professional, experienced, and that I want to work with her. I’m dedicated to my work and my business is going strong because I provide quality work. So, let’s review. Why should you advertise in a magazine or print media? It’s a permanent way to reach your target audience. Your ad will last forever. Unlike GoogleAds or Facebook ads that have a certain run-time, your run-time is unlimited with print. No end dates in sight. You won’t be aiming in the dark. The people who read a magazine are actively engaged in the content. They’re interested and they want to learn more. Instead of paying to put your ad up on Google where anyone can see it – whether they need your services or not – you’ll be reaching people who actually do need your services! It’s a cost effective way to getting what you want. Sure you’re reaching less people, but you’re reaching the people who will actually make the call to book you. Consumers find it more credible than internet ads or a Google search. If you type in wedding photographers in Northeast Ohio into Google right now, you’d get 162,000 results (seriously, I tried it). If you look at a bridal magazine for wedding photographers in Northeast Ohio, you’d find 10-15. That’s a more credible and reliable selection because brides know they can be trusted, and those are the photographers that are booking more weddings. Print advertising increases your exposure. Not only does it increase your pass-along exposure, but it will also increase your search exposure, which will boost your site in Google, causing it to come up first in a random search. If nothing else, this reason alone should be convincing enough to make you a believer of print magic. Still not convinced? Read what some of our clients had to say on our reviews page, or check out this impressive list of Northeast Ohio companies who are convinced that print works magic. Talk to one of our reps today to reserve your space in our next magazine and start reaping the benefits.